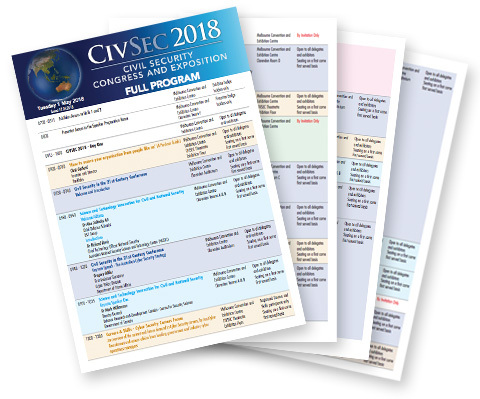 Please find following a PDF of the CIVSEC 2018 Event Program. Chris Gatford is the Founder and Director of HackLabs in Sydney, Australia and performs penetration tests for organisations all around the world. Chris has reviewed countless IT environments and has directed and been responsible for numerous security assessments for a variety of corporations and government departments. Specifically, and somewhat uniquely Chris has been performing Penetration Testing for over 12 years commercially. Chris has co-authored “Network Security Assessment: From Vulnerability to Patch” from Syngress Publishing. Chris is also a frequent speaker at many security related conferences. Chris is a member of several security professional organisations and is a Certified Information Systems Security Professional. Chris has appeared on ABC News, Channel 10 News, Bloomberg TV and ABC’s Four Corners. Joseph M. Siracusa is Professor of Human Security and International Diplomacy and former Deputy Dean of Global and Language Studies (2009-2015) at the Royal Melbourne Institute of Technology University and President of Australia’s Council for the Humanities, Arts and Social Sciences. Born and raised in Chicago and a long-time resident of Australia, he studied at the University of Denver and the University of Vienna and received his PhD from the University of Colorado (Boulder). Professor Siracusa is internationally known for his writings and commentary on presidential politics, nuclear history, international diplomacy, and global security. He is also a veteran political affairs commentator in the Australian media, including ABC Radio and Television. He has worked as an account executive at Merrill Lynch, in Boston and New York; the University of Queensland (Brisbane); and for three years served as a visiting fellow in the Key Centre for Ethics, Law, Justice and Governance, Griffith University (Brisbane) where he specialised in issues related to nuclear non-proliferation and counter-terrorism. Professor Siracusa has authored and co-authored numerous books, including: Real-World Nuclear Deterrence: The Making of International Strategy (2006); Reagan, Bush, Gorbachev: Revisiting the End of the Cold War (2008); Nuclear Weapons: A Very Short Introduction ( 2nd ed., 2015); Globalization & Human Security (2009); America and the Cold War, 1941-1991: A Realist Interpretation, 2 vols. (2010, nominated for the Pulitzer Prize in History); Diplomacy: A Very Short Introduction (2010); Crime Wars: The Global Intersection of Crime, Political Violence, and International Law (2011); A Global History of the Nuclear Arms Race: Weapons, Strategy, and Politics, 2 vols. (2013); American Foreign Relations since Independence (2013); The Death Penalty and U. S. Diplomacy (2013); A History of U. S. Nuclear Testing and its Influence on Nuclear Thought, 1945-1963 (2014); The SAGE Handbook of Globalization, 2 vols. (2014); the Language of Terror: How Neuroscience Influences Political Speech in the United States (2015); Presidential Doctrines: U. S. National Security from George Washington to Barack Obama (2016); and Weapons of Mass Destruction (2017).